My room looks like a fabric store exploded in here. It's the combined effects of working on a last minute Christmas project and a string quilt at the same time. 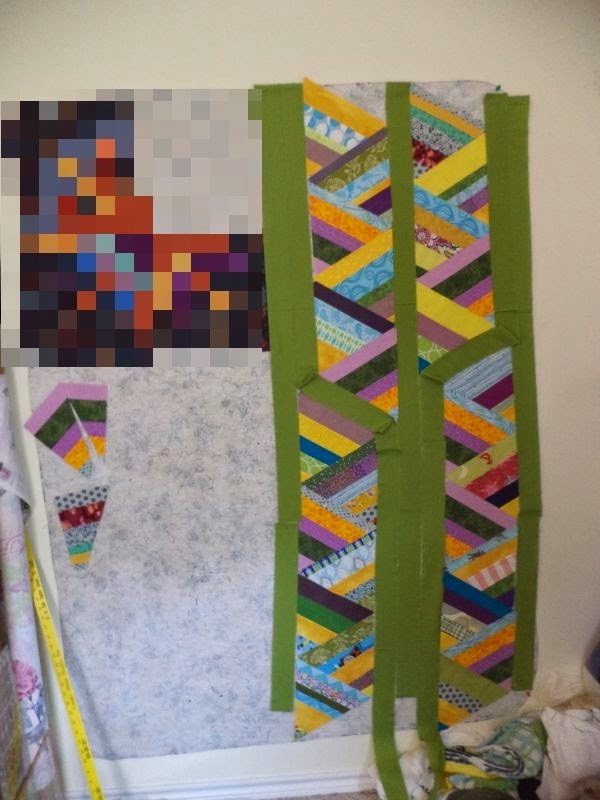 I now have 2 of the 5 columns I need for the string quilt finished. Last night as I was moving them over to make room on the design wall this broken herringbone sort of design emerged. I added to green sashing strips to see how it looks, what do you think? Haha to the snooping and the exploded fabric. I'm so proud that I actually cleaned my work space in the living room yesterday. Then again, I'm not touching anything new until the baby's out and Christmas is over. Just finishing things by hand now. Good luck with all your Christmas sewing!